For Mohamed Hashim, a Ph.D. student in chemistry at the University of Houston, his research can be thought of as ‘molecular architecture,’ in which he synthesizes molecules which assemble into an orderly crystalline framework. 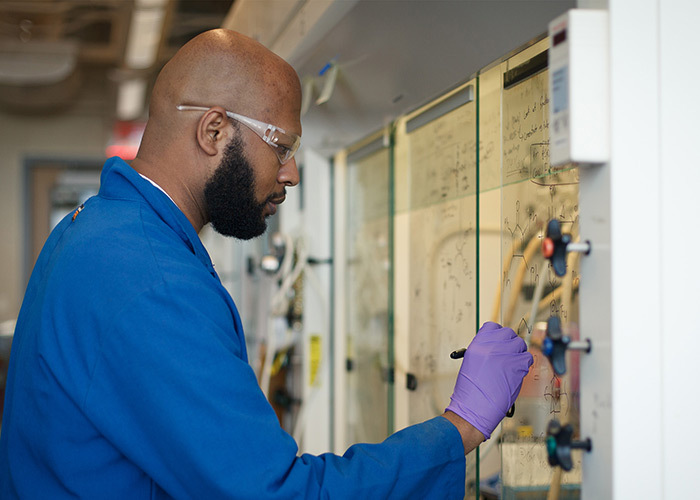 Mohamed Hashim, a Ph.D. student in chemistry, works on a porous molecular crystals, which have potential applications for recycling anesthesia.Along the way, results from this research have been leveraged into a startup company, Resthetics, which seeks to recycle hospital anesthetics. “These molecules are my version of a skyscraper,” Hashim said. Hashim’s research involves synthesizing porous molecular crystals, which form a lattice-work structure surrounding empty pores, which can trap different molecules. This research is conducted under the guidance of associate professor of chemistry Ognjen Miljanić in the College of Natural Sciences and Mathematics. “If these materials are designed with great care, we can control the size and shape of the pores as well as the environment within the pores,” Hashim said. Applications for these materials include filtration, storage and drug delivery. These porous molecular crystals were originally synthesized by accident, by one of Hashim’s previous lab-mates, Teng-Hao Chen, who is now an assistant professor at Tamkang University in Taiwan. Chen had attempted to synthesize a metal organic framework molecule, in which a scaffold-like structure of atoms is held together by a central metal ion. However, the end product was a crystal in which the metal ion had disappeared, leaving only empty pores behind. So Hashim set out to see if these porous molecular crystals could be systematically synthesized, or if this was a one-time accident. However, Hashim was able to work out the mechanism by which these crystals form, and since then, has gone on to make more. As it turned out, these crystals assemble as a result of attractive forces between indvidual molecules, which interlock to hold everything together. In an effort to find an application, Hashim is involved with a startup, called Resthetics, which would use this material to recycle anesthesia. As part of this startup, which is in collaboration with the Wolf Center for Entrepreneurship, Hashim has spoken with investors, attended pitch competitions, and taken part in an accelerator program at the Texas Medical Center. Resthetics seeks to solve a major problem with anesthetics – the high amount of waste. An estimated $1.5 billion in anesthetics is wasted each year. In addition to being wasteful, these anesthetics are also damaging to the atmosphere. “The idea is that if we can recapture these anesthetics, we can reuse them, minimizing cost, and the impact on the environment,” Hashim said.